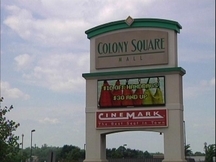 NEW YORK â€“ Zanesvilleâ€™s Colony Square Mall has been sold to a New York real estate firm. Time Equities Inc. in New York City has purchased the 425,430 square-foot mall for $31.5 million. The New York company owns assetsÂ in 24 states and the Colony Square Mall is now their largest retail asset in Ohio. Urban Retail Properties, LLC, will oversee the management of the 36-year-old mall.